I’m going to rant a little; my comments are about process and fad, not about the quality of the images that are made or the ability of the artists making them. The medium has people who are great at it and those who aren’t, just like in traditional media. The “new” craze is to take your IPad, other tablet pc or laptop and paint either outdoors or in a studio setting like life drawing. My reaction is why bother? Unless you work in an industry where the facility gained painting on a computer translates to your job, there is no upside to it as an artist. It isn’t even that new. When I was an in-house production artist we started painting with our computers in the early 90’s. I have been painting with my laptop since the early 2000’s. The industry and to some extent illustration has been digital for at least 15 years now. The fact that my aunt now has an IPad and paints with it, doesn’t make it new or very interesting. If you think finger painting on an IPad is difficult try painting with a mouse in index color using Deluxe paint. Not really. A tablet computer will run you $400-800 for the tablet alone; double that for a usable laptop. Then make sure you add a 300-500 for some decent paint software and maybe a stylus with pressure sensitivity. If you have a laptop you will need to buy a drawing tablet like a Wacom Intuos, add 300. You will need an extra battery on your laptop after it runs out so add that second battery cost to the hardware section. The IPad doesn’t have a replaceable battery. So you have 5 hours of practical battery life for each charge. With traditional painting you can recoup the cost of the materials by selling the paintings when you’re good enough. Oh yeah, right, there isn’t an actual painting. You could print out the image you do and make a giclee of it but those are just poster quality reproductions with no real intrinsic value to them. First you would have to buy a printer and inks and paper to print it on. Remember the file would have to be a high enough resolution to make the print acceptable. You might be able to get 20 bucks for it. People are claiming that digital is closer to true color and light because it is additive, not subtractive like painting. Untrue, for it to be additive it has to produce white when you mix the colors together. All paint programs on a computer mimic subtractive painting; so it’s even dumber than painting with real paints because it takes an additive environment (the monitor) and makes a false subtractive output (the paint program) which is code written by people who aren’t artists so other people can use it to paint with. The biggest problem I see for practitioners is digital art leaves nothing tangible for the effort; no chance of selling it for any real money, which forces digital outdoor work to be a hobby or just practice. I think that mindset affects the outcome of the work. Part of the destruction of design, production and illustration wages can be linked to this attitude. Digital image creation is geared for disposable art and massed produced and cheaply made prints. It has to do with the marketplace and the value of physical originals over prints that lack uniqueness. For it to be taken seriously digital artists must overcome that idea and create a paradigm shift in the thinking of collectors. I personally don’t see that happening in my lifetime. Thank you for putting into words exactly what I've been thinking. I also agree with you. The method used by an artist should match the final use for the painting. 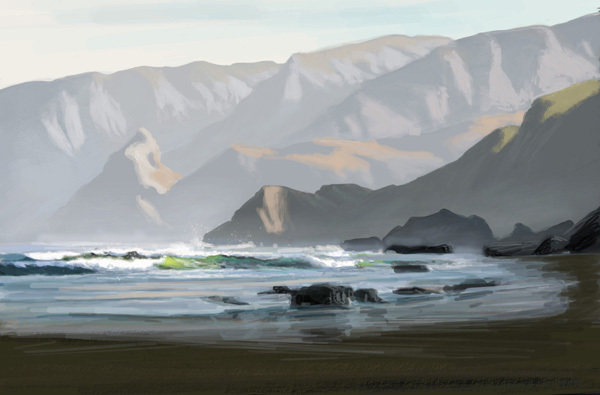 A digital piece is great for concept work because it's quick and mess-free. Storyboarding is also a good area to use digital painting. Anything that requires the public to view the image should be done traditionally. The eye can tell the difference, even an untrained eye. The viewer may like the flashy look of a digitally painted book cover, but it doesn't convey the sense of humanity that a traditionally painted cover conveys. Ideas are better delivered digitally, but if you want to connect to a human with your work, it must be done by a human hand. Thanks for posting this. I've never personally considered anything created with a computer/software/tablet to be fine art, and never will, regardless of the subject matter or how well it is painted, or how shrill and defensive the digital artist is about the subject (back when I used to read WetCanvas, there was a lot of that. Probably still is). I think using these virtual painting tools might have some value if there was any transfer to traditional media, but I don't see that there is, so I have no interest in even trying it. That being said, I think the computer and all the electronic media are probably great tools for graphic designers and professional illustrators, and that's what I view digital art as anyway: illustration. When taken in that context, I've seen some remarkable work created. I paint in photoshop almost exclusively, and when I started reading this, my initial reaction was "aw, it's another dude who doesn't believe that the medium doesn't matter." After I finished reading it though, I think you made some good points that shifted my perspective on a lot of things. 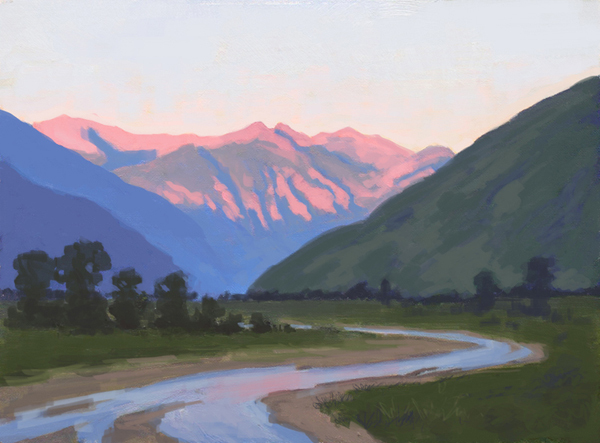 That said, I still think digital is cheaper, because most people already have a computer of some sort, and only need a tablet and hiking supplies to do digital plein aire (~$600 total). These supplies can last for 3-5 years of painting every day. I'm no expert in oil prices, but my 5 portraits ran up to about $400. Finally, I've been planning to do digital plein aire for a while now, and after reading this, I'm considering switching mediums for painting from life. I've attended shows of digital work and always find them lacking for the reasons you mention. It is not a skill level problem but the fact I am always aware that I am not seeing a made thing but the recreation of something. I don't know if I agree with you on cost, but like you've pointed out traditional can be expensive too. I just know my equipment doesn't have a shelf life because of an operating system. I am not against digital painting, as I've said I do it all the time.There are many talented people working with digital mediums. 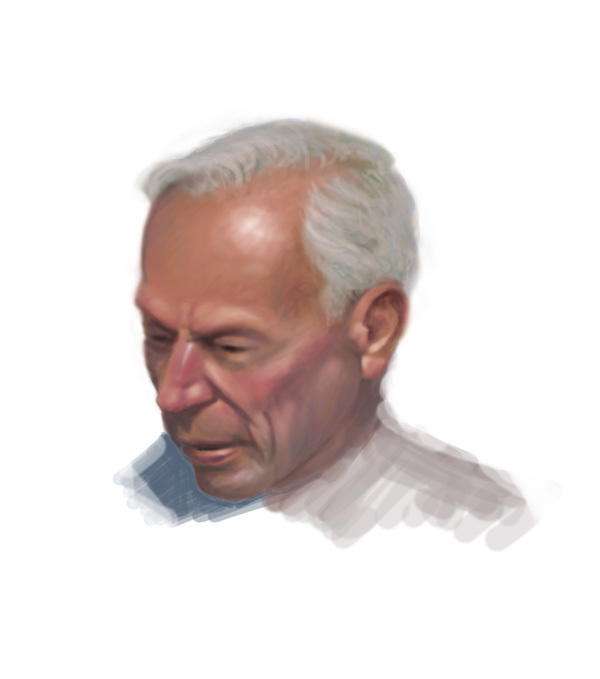 Ley me know if you find an additive function for painting in Photoshop, I'd like to try it too. I don't draw as strong of a distinction between illustration and gallery work as your comments suggest. I also don't think traditional artists can claim any high ground based on medium alone. Plenty of crap out there in 22k frames painted on heavy weight oil primed linen. My biggest concern is the lack of anything tangible. How technology affects markets of art and what it holds for the future of art collecting. Great observations. I agree with you and maybe that explains the ease most traditional artists adopt digital but not the other way around. I think the tactile overload might have something to with it. Digital tools lack the tactile experience you get mixing and applying wet, or to a lesser extent, dry traditional media. One thing is for sure, digitals ease of use for corporations will not bring traditional back any time soon to production or illustration. There are several points in this post that I really want to disagree with you about, but I'll stick with the major one. You talk about there being nothing tangible, no physical object to sell except for some 'poster quality reproduction with no real value…'; I think you are lacking a deeper perspective on art here. You are basically dismissing every work of art made with mediums like photography and video with that bathwater. Would you tell Cindy Sherman, Bruce Nauman, Matthew Barney, Bill Viola, and also every artist whose work involves the documentation of performance art, etc. that they have made nothing tangible that they can sell? I think they would laugh you all the way to the bank on that one. Of course you realize by the title of my essay that I'm talking about painting. None of those people paint or they don't paint anymore, maybe they did at one time. Anyway, you are right that the kind of endeavor you are talking about lies outside my idea of permanence and for the most part, art. I must say that if the desired result is to mimic an oil painting, pastel, or watercolor, then why not adopt the medium itself rather than attempt replication. Same can be said for photography attemting a painterly feel, or hyper-realist painting attempting to match photography. With that said, I am ever amazed by the concept art works, illustrations, and 3D meshes pertaining to the digital gaming industry. These really pull their weight in an area all of their own. Lastly, I was going to comment the same thing as Sam above. Permanence is not an essential prerequisite to art. Dancing, jamming, and to stay within the visual realm, mandalas created by Buddhist monks are valid forms of art that are ever impermanent, and even praise this impermanency. It is others that make feeble attempts at recording these through other media. It's not black and white; you can't create the same traditional expression in digital but that also applies to vice versa. So why dismiss an entire form of artistic expression that, like traditional, will yield happy accidents that you can bring over to different mediums? It's a novelty yes but if it gets digital artists out of their photographs studies: Hey, win/win. I'm saying it will be hard to take it seriously as painting when you have nothing to show for your efforts. I agree getting outside and away from copying photos is a good thing. I agree with your fist two comments. One aspect that I think you're overlooking is that it's a medium with it's own intrinsic characteristics. A mark made directly with the tip of a finger has it's own unique qualities, entirely different from the charm of a mark made with a long-handled filbert. I would argue that it's as legit a medium as etching or lithography, both of which produce something at least one step removed from the original stroke. And of course there's the option of displaying the picture on the device on which it was made, which seems an awkward solution but does acknowledge that how best to view the thing is still an open question. By the way, the painting program I use on my wife's iPad cost around $5, and the machine seems to run 10 hours or more without recharging. I agree it can be enjoyable but to paraphrase the matrix movie, “Do you think you’re making a mark with your finger?” In traditional painting, drawing and print making you actually make marks on copper or paper depending on the medium. You are actually adding ink, graphite, paint or with etching carving into the plate. Nothing even close to that is happening with a computer. I think ten years is too soon, but who knows? Somebody needs to come up with smart paper or canvas that is cheap enough to buy in quantity so that you can run a stylus over it and create an image that can’t be transferred to another device thus creating an original electronic image. Since you mention it, Wacom's way ahead of you on that idea ( http://www.wacom.com/en/Products/Inkling.aspx ). 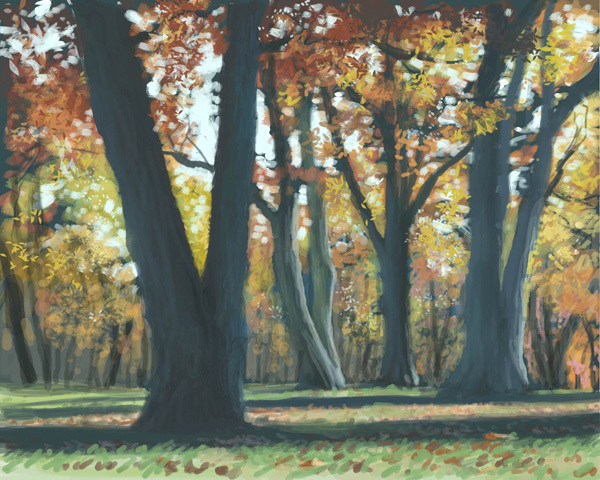 I've recently taken up oil painting for the pleasure, but my work is almost exclusively digital because it's faster and more flexible (however, I do mainly graphic design and 3D animation, so the requirements are very different) I've never tried digital plein aire simply because I'm unconvinced the displays are suitable yet. When I want to capture light, I find it invaluable to be working in the same sort of light as my subject, and unfortunately that's almost always impossible with current screen technology. But your complaint about painting programs using subtractive color is completely false. See the Photoshop documentation for more information ( http://help.adobe.com/en_US/photoshop/cs/using/WSfd1234e1c4b69f30ea53e41001031ab64-77e9a.html ). I don't doubt that some programs do have self-imposed limitations (to my knowledge, MyPaint doesn't have a choice of blending modes), but that's by far not the norm. I not only disagree, I'm offended by the shallowness of your argument. Firstly, when discussing costs, you have a ton of bias in your analysis. Most people probably already own a computer or laptop and printer (especially, ahem, those who happen to be READING A BLOG). Piling those onto the "high cost" of switching to the digital medium just shows your desperation for evidence. True, to get a tablet and good software it could be a $1,000 bucks or so, but that's a one-time payment. The same could be said for traditional painting. To buy an easel, smock, fan, plein air equipment, AND expensive paints and brushes that constantly need replacing… the list goes on. Both are expensive. Starting in either is difficult. I would say that's a draw, if not a win for digital art as all of its payments are one-time only. You're focusing solely on fine artists, assuming they're painting in hopes of selling the work later. The majority of digital artists, however, tend to be the commercial workers in pre-production positions, such as concept artists. For them, the flexibility of the digital medium is unbeatable, and no matter how many versions they scrap they never have to worry about buying more paint. No, they aren't going to be selling their sketches… though the good artists can assemble an art book to publish and profit from, in addition to the money paid from the client who hired them to draw the concept in the first place. Same for animators, graphic designers, etc, who have an essential crossover onto the computer anyway as part of the final use of their art. I agree that many fine artists switching to an iPad for no real reason.. well, don't have any good reason to. But if they want an easy way to stay in practice and/or do a couple studies on-the-go without having to drag a ton of paints, brushes and an easel around with them, it's invaluable. No, they aren't going to create gallery pieces. That's obvious. It's also, I thought obvious too, NOT THEIR GOAL. The digital work is practice. Also, for a serious artist looking to explore the future of art, spending $300 for a highly portable new way to paint and experiment–a fresh new tool… not that expensive, in the long run. Either way, it's their choice. Your rant is highly bias, poorly thought-out and creates a pointless anti-digital crusade. There's a place for traditional and a place for digital. There's also a place in between for people to experiment, push their horizons and have fun. You don't have to "purify" that zone. Let it be. Thanks for the comments. Afraid to post as a unique entity? Yes, I know people have computers; having a computer and having one capable of running CS5 with a tablet is another animal. It is also not a one-time payment, as you have to update your software and hardware every two or three years to stay current. As an example if you haven’t updated in the last two years you don’t have an iPad rendering your argument moot . Also you must not paint outdoors much, no one wears a smock and the last person to have a fan was William Merritt Chase who hired a Butler to fan him while he painted. You’re also wrong about selling not being the goal for some digital painters. If that were true Deviant Art would be out of business. I do agree that it is good practice and I can only hope concept and production artists are painting from life every chance they get, although looking through the last couple of Spectrums it doesn’t seem like many of them are, to the industry’s detriment. Perhaps many artists and many people don't have capable hardware, but the point remains that a great number of people simply do. High-end computers are fairly necessary for digital art jobs, so that includes that entire category is included, avid PC gamers will, including yet another large category, and of course the iPad has simply become a chic fashion item, and everyone seems to have one. I don't, and I don't want one, but the point remains, a great many people already have the necessary hardware. The most anyone in these categories might have to spend to get started is about $80 on a low-end tablet (you could spend hundreds of dollars on software if you're a tool, but generally avid computer users will either know of free alternatives or be professional and need the expensive packages anyway). Also, the DeviantArt structure, at least my impression of it when I was there, was not that you were selling actual physical pieces of art (though you were free to), but rather commissioning the labor and license to art you make. It's a big difference in a lot of ways. Also, come on, don't be immature. You may have looked at a magazine or TV show that you didn't like, but you should know that there's more better art around today than there ever was at any point in history. Sure, some people may not be focusing on the same aspects you do, but there's a difference between saying you'd like to see more of your style and saying people are bad because they don't do it your way. Wow that reference to indexed color, DPaint and painting with a mouse really brought back memories! I have painted traditionally all along, but in the early 1990's also started digital painting. Now that's how I make my living full time, as an illustrator. For me it is much more practical, for my commercial work. I agree 100% – it's for mass produced printed work (and web work). It's also great for concept work and visual development. I don't see the need to stress "cheap" in there, btw! So if your work is about making OBJECTS, then keep using physical paint. If it's about making PICTURES, then the tool used doesn't matter. The vast majority of the public will see the work on a computer / phone screen, or in print. Only a tiny fraction views, let alone buys, physical originals. Huh, what is this? I thought people were over the digital vs traditional thing. One thign you're missing is this: if I spend three hours painting digitally, 1 min is File->New, 2h59min of it is painting. If I paint traditionally, half of the time goes into juggling tubes, mixing paint, rinsing your brush and a lot of other things that might improve the dexterity of your fingers, but don't actually teach you anything. 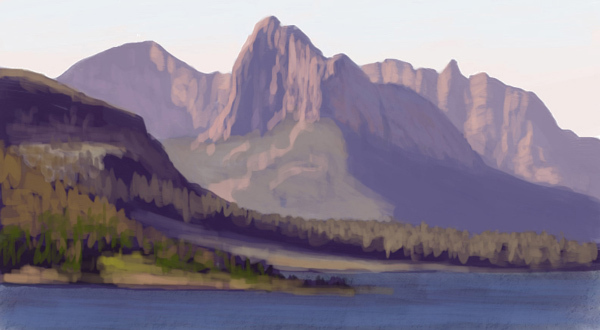 Working digitally, I think, is a lot purer in terms of how much of the time you spend with actual painting. It teaches you a whole lot more in a given amount of time, since painting happens in your brain and your eyes, the true challenge lies in understanding what you paint, not in handling the medium. One of the coolest things about my new ipad is that I can paint whenever and wherever I want. If I'm bored watching my wife shop for purses, I can sit down and pull out the pad for a good 20 minute sketch. It's the new "craze" because now it's easier than ever to do art anywhere. And you said… "Unless you work in an industry where the facility gained painting on a computer translates to your job, there is no upside to it as an artist." I would say that statement applies to each and every artist, right? If you get in any practice at all, either on a ipad or a sketchpad, it translates to the artist's learning. So there's always an upside. Industry is irrelevant to practicing what you want to practice. The ONLY area that it doesn't make any sense to use digital media is fine art for the same reason as you suggested… no original. You also said "Digital image creation is geared for disposable art and massed produced and cheaply made prints. It has to do with the marketplace and the value of physical originals over prints that lack uniqueness." You mean the fine art marketplace? If so, I agree…. to a point. On the fine art side of it, I'd more likely buy 50 prints of certain digital artists works over 1 original with the same artistic skill. And on the "disposable art" comment, I think you are way off base. Digital art isn't inherently disposable. I'm not sure where you're getting that idea. Some of the best digital artwork these days is done in the game industry where fans like me view the art as important as the game. I constantly look on good game art for study and inspiration. I generally agree with your observations. I do think though the availablilty and lack of uniqueness for digital art lowers its value for the artists that make the work. We just disagree. Its obvious you don't paint traditionally because none of what you said is true about painting. It takes me five minutes to set up outside in the studio even less time. We agree on some things but my point about digital being cheap still applies to game art. The work is rarely seen after the game fades in a year or two. Most studios don't want their artists selling production art from games as a side line which also adds to its disposability. I know this because I've been in the industry for 21 years. Most of the art I've done for games has vanished when platforms changed for them. You would have to constantly change the size and resolution of the art to keep it current.